According to the report published by Ookla, Jio has 99.3 percent general availability of 4G network, whereas Airtel has the highest 4G speeds at 11.23 Mbps. Ookla has published results for general availability and 4G availability across 15 cities. The finding is that Jio’s General Availability and 4G availability was the best. For 4G speeds, Airtel has the best speeds. Ookla analyzed the general availability and 4G availability in India. To do this Ookla used coverage data from 250,138,853 samples on 595,034 enabled devices during Q3-Q4 2018. 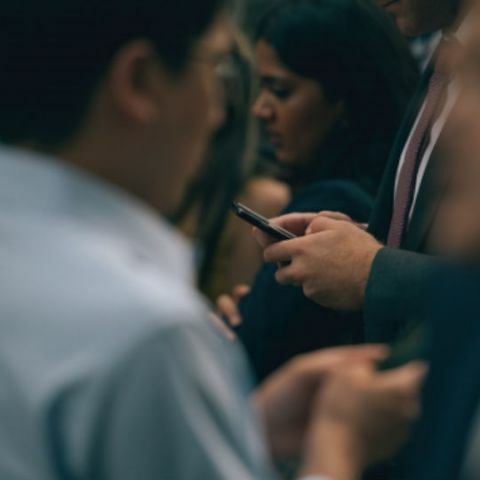 According to Ookla, “General Availability is the percentage of an operator’s known locations where a device has access to any kind of service (including roaming). 4G Availability is then the percentage of an operator’s known locations where a device has access to LTE service (including roaming)”. The result of Okla’s analysis is that Jio’s General Availability was the best at 99.3 percent followed by Airtel at 99.1. The next is Vodafone, very closer to Airtel with 99.0 percent general availability followed by Idea at 98.9. You can check out the details of the general availability on a map on India on the Ookla website here. Moving on to 4G availability, Jio once again tops the list with locations with LTE service in India with an availability of 98.8 percent followed by Airtel with 90 percent available. Next is Vodafone with 84.6 percent availability followed by Idea 82.8 percent availability. When it comes to the 4G speeds however, the ranking changes. Here Airtel tops the list with an average speed score of 11.23 Mbps followed by Vodafone with a speed score of 9.13 Mbps. Third here is Jio with a speed score of 7.11 Mbps and fourth is Idea with a score of 7.02. Ookla says, “Airtel was the fastest mobile operator in India during Q3-Q4 2018, regardless of whether a customer was on LTE or not. The ranking of the other operators does not change based on LTE use with Vodafone taking second fastest, Jio third and Idea fourth”. 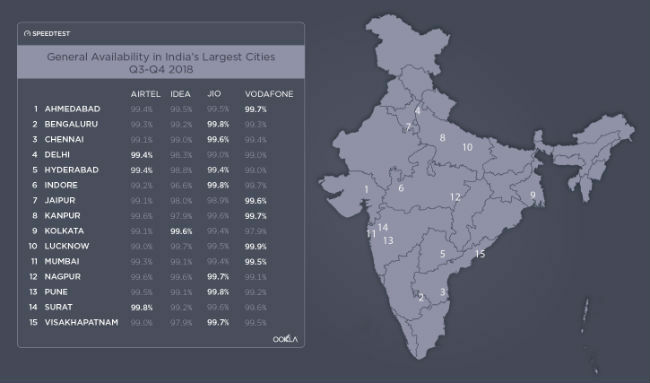 As the image below shows, as far as General Availability is concerned, Vodafone is strong in 5 of the 15 cities, Jio is strong in 7 of the 15 cities while idea is strongest in one and Airtel in three. Coming back to 4G availability, the image below shows that Jio is hands down the winner in all 15 cities. What is interesting to note is that even though Idea and Vodafone merged in 2018, they still operate independently in India. If they were to merge in operations then their overall General Availability would be better. However, it would still take their combined force some time to take on Airtel and Jio in terms of 4G availability.